The Foursquare Missions is constantly update with resources to help your congregation engage in supporting the work taking place around the world. Visit www.foursquaremissions.org/pray/ to access these resources. You can also download the current FMI prayers guide below. Missionaries are found in every age group and culture around the world. From our youth hearing the call at camp, to our more mature “seniors” in a later season of life, to everyone in between, our churches are full of potential missionaries needing to be equipped and deployed into the the field. FMI (Foursquare Missions International) has training opportunities for the various stages of readiness, but what they need the most are potential names. We are currently helping to build a pipeline for identifying, training and deploying future missionaries from our PSW district...and we need your help! Do you have 1 or 2 names of potential missionaries that you would like to suggest be included in our recruitment database? We'd love to know who they are. It’s as easy as a simple email to johanna@thebridgersm.com. As your District Missions Reps, we will help connect them to FMI for training and deployment. Time is short, and the harvest IS plentiful! Let’s join together and get the laborers to the field. We can’t wait to celebrate the release of more and more missionaries raised up from our PSW churches by the power of the Holy Spirit. Several of us just returned from an incredible trip to Colombia. We came to see the dynamic church-planting partnership between Compassion International and Foursquare churches in Colombia. Together they are planting churches in highly impoverished areas where children are most vulnerable. Each church launches with 200 sponsored kids from 200 different families in the immediate community. Compassion partners with volunteers from the church to feed, disciple, & mentor these kids toward holistic health. This February, Cyclone Gita ripped through the island nation of Tonga. Please keep praying for our PSW Area Missionaries Jerry & Julie Stott as they continue to encourage the Foursquare pastors in Tonga. 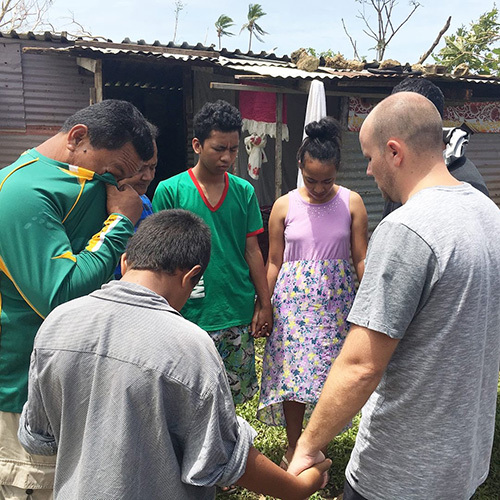 Close to 30 Foursquare families have been impacted as well as the church in Tonga. Although this was the worst storm to hit Tonga in more than half a century leaving a trail of destruction in its wake, it didn’t deter Foursquare members in the South Pacific island nation from gathering to worship, even though their usual meeting place was damaged. Foursquare Disaster Relief (FDR) quickly partnered with local Foursquare leaders to be "the tip of the spear" for relief. You can find out how the compassionate actions of leaders in the South Pacific have kept churches open and families safe by clicking here.